Word to the wise: When you play a rigged game in a mobster-run casino, don’t expect to walk away with all your winnings. But you already knew that, didn’t you? Regardless of whether he knew it or not, Apple CEO Tim Cook just learned that lesson the hard way. In 2013 the European Commission began investigating Apple’s tax deals with Ireland. In 2014 it came out with its formal allegation, namely that the taxation deals worked out between the government of Ireland and Apple’s Irish subsidiaries in 1991 and 2007 constituted a violation of Article 108(2) of the Treaty on the Functioning of the European Union (which, as we all know, relies on Article 107(1)‘s definition of activities “incompatible with the internal market” of the EU). This scrutiny naturally comes in response to Apple’s employment of the trusty old “double Irish with a Dutch sandwich” tax strategy, among other gambits. Clear as mud? Good. Here’s the non-gobbledygook explanation: The state is a group of gangsters running a protection racket. You can play by their rules and jump through their hoops as much as you like, but when they decide you’re getting too big for your britches they swoop in to take you down a peg. In this case, the loser is Apple. The tech giant has just been handed a bill by the European Commission for 13 billion euros in back taxes for breaking laws that didn’t exist when they broke them. Or guidelines. Or interpretations of article treaties. Or something. Apple is happy with their tax arrangement with Ireland. Ireland is happy with their tax arrangement with Apple. But the EUreaucrats are the bigger gangsters, so they are demanding their pound of flesh. Now before the false dilemma fallacy is invoked, let me make it crystal clear: This is no defense of Apple Inc., its police state control grid indoctrination gadgets (and patents), its cozy relationship with law enforcement agencies, its easily hackable (and backdoorable) products, or its pretense of standing up to the FBI while secretly opening giant back doors for the Chinese government (and who knows who else). Apple is a vile state-collaborating monstrosity that is more interested in preserving its walled gardens than contributing to the open source revolution that will (hopefully) destroy it. No, Corbett’s Law pertains here: In this contest between Apple and the EU there is no “good guy” to root for. But we have to examine this fight from the broader perspective of the precedent that is being set here. As I’ve pointed out before, the global taxation grid is being slotted into place in the name of fighting the evil multinationals and their global tax loopholes. The very same tax information sharing agreements that are already being hammered out by the OECD behind the scenes to get the big bad corporations are also ready to start scooping up, databasing and sharing information on every individual in every participating country, too. We are truly entering the global tax grid, and it will be ruled over by the very types of EUreaucrats (or their global government equivalents) who can decide on a whim that your current taxation level is unfair and arbitrarily hand you a bill for back taxes. Welcome to our future globalist nightmare. None of this is surprising from a voluntaryist perspective. The implicit assumption of taxation is that the mob (sorry, the “state”) has a rightful claim to a portion of your earnings. Once that has been accepted, the only question is what percentage between 0% and 100% they are going to claim, and that is almost always a measure of how much they think they can take before a revolt happens. Once you assign legitimacy to the ruling class mobster state and their demand on your wages the mobsters have already established what you are. Now they’re just haggling over the price. Somehow I doubt that’s the lesson that the mainstream media will take away from this story, though. Render unto Caesar what is Caesar’s. I’ll gladly give the banks back their fake money while I work towards self-sufficiency. The only reason I have their money is cause they made this system and issue this useless currency. The worst thing about these Federal Notes is that they put such central bank hating Presidents on them such as Jefferson and Jackson. Can only imagine either one those men would rip such a piece a paper in two and burn it. Agreed. I’ve been thinking about that quote “Render unto Caesar what is Caesar’s” a lot lately and what Jesus really meant by it. As a Christian and an Agorist I struggle with some of the scripture. Contrary to many Christian scholars, I think an argument could be made that since Rome was an occupying force in Israel, Caesar deserved nothing. But in the preceding verse, Mat 22:20, Jesus asks “Whose picture and title are stamped on it (Roman coin)?.” So Jesus could be saying that if you participate in Rome’s system of currency, conquest, plunder and all the modern conveniences of the the Roman system, you need to pay the State what it demands. One thing is certain just as in Roman times, especially obvious here in Madison, WI, the State has been elevated to God-like status. It having its own aspects of religion; taxes as tithing, politician as priest/rabbi, and the military as crusader/evangelist. As a Christian I am to have no other god, so it pains me to see so much faith placed in the collectivist State. The Caesar when Jesus preached was Tiberius, an interesting guy for his invocation of the lex Iulia de usura (that is, against usury) in AD 33. See Tacitus Annals VI, 16-17 on what ensued, one of the most eye-opening and informative passages on ancient finance and economics. What Jesus was really saying was obey the state, and focus on spiritual matters and his brand of proselytizing ; by which he meant the synthesis of Judaism with Hellenism, in opposition to the traditional Judaean cult, culture, language, which he considered too backward without a serious innoculation with Hellenic culture. James is fundamentally mistaken to identify the state with the mod. financier gangsters who seek to control it. Its a weakness and inconsistency throughout his analysis, because sometimes you’ll see him advancing the point that nation state sovereignty is or can be a bulwark against the financier gangsters, as in the Brexit case. And this is certainly correct. The virulent Christian church hostility to usury until about WW1 (when it joined the ranks of the usurers) was in large part a product of the Roman outlawry of it. The Tacitus passage gives a brief summary of usury in Roman history, stressing the frequency of legislation to suppress it and the even greater frequency with which it re-emerged in one inventive form or another. This struggle forms the core of Roman social and economic history. The fall of the Republic (which built the empire, which fossilized under the Empire) was largely the result of the last generation of Roman aristocrats siding with creditors and usurers, and Caesar the dictator’s lex de usura (the lex Iulia which Tiberius resusicated after long abeyance under the gangster scum Augustus Caesar) was a smart piece of legislation to enlist the support of the urban population in his overthrow of the free state. Populi Romani exercitus Cn. Pompeium circumsedet, fossa et vallo saeptum tenet, fuga prohibet : nos vivimus et stat urbs ista, praetores ius dicunt, aediles ludos parant, viri boni usuras perscribunt, ego ipse sedeo! This seems at least as eloquent as Petronius, in meaning if not in length. You’re missing the point about my cui bono question, which addressed, and can address, only the motivations of the governmental and magisterial authors of the lex Valeria and lex Maria. Look the real rulers of a country are those who control the greatest agglomeration of privileges. Its only in modern western societies that private financiers have seized de facto, remote control of government and of public information. In this case the weight of privilege invested in the fractional reserve banking system across the several centuries of its existence, namely the rights to create and cancel money in the epoch of industrialization , eventually came to outweigh and overrule all meaningful concepts and practices of governmental rule or public sovereignty. But in Republican Rome the houses of the clan chiefs, evolving into patriciate and nobilitas, virtually monopolized privilege of every stamp, and the most important among these included money creation and the public and private control over manpower. Nobilitas was chiefly defined by freedom from personal services and attendance upon a patron. It was a (the) class of patrons to which everyone else in society owed obedience by iron and ancient tradition far more potent and efficacious than mere law because embedded in the morality of the whole community. The Gracchi initiated an assault upon aristocratic privilege by legislative means which sought to morally stress the political importance and dignity of the citizenry as a whole, and to raise up a class of business wealth which might rival the aristocratic. This programme was focused upon the great imperial taxation collection contracts and membership of the jury pools which judged criminal trials mainly concerned with public administration by the ruling class of patrons. A new class of publicani super rich was created which might rival and intimidate the aristocrats, but they were in no position to overawe or overthrow them. The hallmark of the epoch was collusion in maladministration and self enrichment, and the main fissure which arose among the aristocratic houses concerned the extent and depth to which this collusion should be permitted. The publicani almost by definition did not hold public office or command public manpower, while the magistracies which alone supervised all public business, drew up and regulated public contracts , and passed all legislation, remained largely in the hands of the hereditary noble houses. While those few “new men” to the magistracies each generation also entered the ranks of the class of patrons by the very act of holding senior public office (curulis aedilitas and above). So, there’s no real basis, whether institutional, de facto, legal or moral upon which the creditors of the 90s-80s could have made, or at any rate effected, demands for payment in only bronze currency. That would amount to a refusal to trade in, perhaps even recognize, the chief coin of the realm which was the silver denarius from about 150 BC. Furthermore, depending upon transactional regulations of the day (which may or may not be reflected in the great and famous body of Roman imperial law still extant today) such demands may have found such creditors out of pocket altogether, if a debtor could claim to have cleared his debt by attempting to pay in the state silver and been refused. All these matters took place in a context of violent internecine strife where even public magistrates could be and were slain in office. Creditors were not in the least immune from such awfulness and therefore even more likely to follow the inherited tradition of collusion with government than in more pacific periods. For all these reasons the compensation theme looks like the most fruitful. And its certainly to some degree in the surviving records (Asconius on the saccularii). I’ll keep looking through that, but have other more pressing projects going on at present, so think it will take some time to do properly. Gotta disagree there Mark. My read is that he has identified (not to speak for him but it’s how I read the situation) the State with the financial gangsters as not one in the same but more as a symbiotic relationship. One must have the other in order to exist. Therein lies the fundamental problem. Break that bond, that is the ability to create fiat currency thus unlimited power (given by the state—-or is it?). Stop it there and the relationship then changes. Wars of aggression, funding of limitless bureaucracy and those who make law via regulation and thus destroy and undermine creativity, design and the concept to growth. The list is a long one and I won’t list them all. It’s just about everything and everyone. As for nation state sovereignty and it’s legitimacy as opposed to the anti-statist’s agenda, not necessarily mutually exclusive to obtaining individual sovereignty. There must be a starting point to halt the march toward global tyranny and nationalism is at least the ability to organize in the quest to go toward ultimate localism and thus, the power of the individual. It’s very apparent where this is all leading and the latest model is to introduce them all at the same time thus, creating confusion, chaos and they sit back and enjoy a confused populous arguing and fighting as they execute their ultimate plan. Global police force, global taxation, non-homogenous populations through forced invasion and so on and so on. The matrix is complex and they use the complexity to confound their “opponent” who is ironically in whom they claim to represent. I have argued that they are intentionally discrediting institutions such as the Federal Reserve and even congress not to destroy them but to introduce a new model…a global IMF or BIS sans individual central banks. The police force is a prime example. They have now stated categorically they wish to introduce a “national” police force (see Strong Cities Initiative) It’s even gone so far as the DHS has now announced that they will “monitor” the presidential elections even though they have no authority what so ever to do so. The Russians have been implicated in the “hack” of the DNC and maybe some electoral results as well. ICAPP being given to the U.N.? Internet gone? Yeah, sure. Help us Mommy!!!! Intervene so we have a fair election and the Russians don’t hurt us. Many dolts will gladly allow this to occur with nothing much said. None of this would be even remotely possible without the central banking system and the ability to create fiat money and thus power and wealth from nothing. There is your symbiotic relationship and why it must all end. They are essentially terrorist organizations and organized criminal enterprises all in one. These are the real terrorists. Totalitarianism is the ultimate goal and the tyranny will never end unless it is halted. These are Progressives (ironic term they chose) and another word for Progressive is Gradualism. They’ve stepped up their game of gradualism and accelerated and made the model more complex to confuse, confound and make it harder to stop. Progress towards what is the question I never hear. I prefer Bolshevism to Progressivism as a more descriptive term. This is The Bolshevik Revolution Part II. Enjoy the party. History supports the argument. No political authority ever achieved absolutism until the people were deprived of a choice of loyalties. It was because the early Christians put God above Caesar that they were persecuted, even though they paid homage and taxes to the political establishment. Elsewhere, Stalin’s liquidation of the religious and fraternal orders followed from his basic premise that the Soviet was the only deity. Mussolini was always bothered by the hold the Catholic Church had on the people, and Stalin would never have been Stalin if he had not brought the orthodox church to foot. Somewhere in Mark’s long reply he said what I think Christ was getting at: leave the State to itself and focus on your own life and spirituality so you may be blessed and so you can bless others. The world has had tyrants since humans gathered into civilizations, and it will until the end. But we as individuals can choose to do what matters: love God and love people. Do unto others and as we would have them do unto us. The governments can blow this world to pieces and we still have these much more important choices to make. They can have their paper, while I will keep my soul. As an Anarco-Christian I would proclaim, but not impose, that the Scripture is clear, asking for a king, which is the modern day state, is a rejection of the Lord (1Kings8). I propose that Jesus was simply pointing out what 1Kings8 clearly states, and we got what we asked for, which is what we do when we vote. The Scripture is replete with less than gracious words for institutional leadership, both state and religious. Try Matthew 23 or Jeremiah 23 as a good start. Those who point to Romans 13 as God establishing the state are reading in things not there while ignoring the theme stated in Romans 12:10. So do what is required by the state when it doesn’t violate the commands of the Lord and otherwise ignore them. Our call is not to collectivize in a state or religious organization, but to individually grant our neighbor freedom. In a way you might hear the “non-aggression principle” in that. However, the non-aggression principle does not have a strong foundation beyond mutual interest. “Love your neighbor as yourself” does have a strong foundation based on what follows “I am the Lord” (Leviticus 19:18). So when the Lord who created everything tells me to love my neighbor because He said so, I must do so by individually granting my neighbor freedom. I agree self-sufficiency reduces your dependence on funny-money, however, no matter what, you have to pay property taxes unless you want to run away into the hills with a gun. The British went to the carribean, invaded the islands and grew sugar cane. When harvest time came they needed workers but the lcoal inhabitants were self sufficient because of rich seas and had strong communities where the children were educated by the elders etc. The British couldn’t have that so they burnt down a couple of huts and said from now on property taxes must be paid or they would burn down all the huts. So now the locals had to work in the plantations to earn money to pay the taxes. That’s how they were monetarised. And that’s how we have to stay in the monetary system we have today because we have to pay property taxes. More than income tax, which can be avoided by being paid in cash, unless you’re homeless or living in a tent remotely, how do you stop paying into, and supporting, a corrupt and thieving system? I’m really asking that question if anyone has a solution! You are right, there will always be crooks trying to get us to play along with their system. And I do not expect to be completely self-sufficient/cut off from the government. I would have to fake my death and run into the wilds as you said, and I do not think that is necessarily the best path. But if this world we live in is a whole set of ball and chains, I suppose removing as many as possible would still be valuable. …those may not be the best link about this but I’ve seen versions of it within many media outlets. Beautiful synthesis, brilliant writing – one of your best, James. I grinned wide with the apocryphal story. I had to look up “apocryphal” – (of a story or statement) of doubtful authenticity, although widely circulated as being true. Thank you, thank you and….yes, again, thank you! 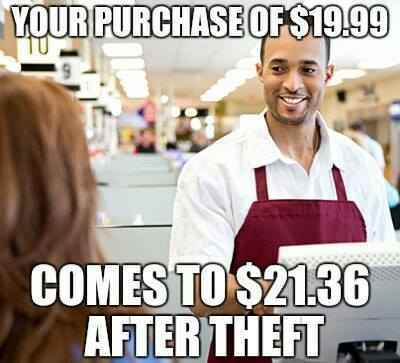 Taxation isn’t so much robbery as it is more redistribution of wealth. People give their consent, so it isn’t really robbery now is it?! Furthermore, it isn’t like someone is pocketing all the money for themselves, most of the money is used to pay for health care in some countries, roads, schools, police and national defense etc…money that has been earmarked in the budget, money that is used to pay for services that a modern society is built upon. The real problem here boils down to corruption and fleecing. We hear politicians say we will hold the government “accountable” and/or our government will be “transparent”…well obviously they aren’t fully transparent, and that’s the problem, not so much taxation. If you happen (like most) to be unaware of how the global banking, credit, monetary (subtle slavery) system works that is propped up and approved by virtually all governments, news organizations, and “higher learning” institutions… then you might well assume that taxation may be more like a banal necessity. 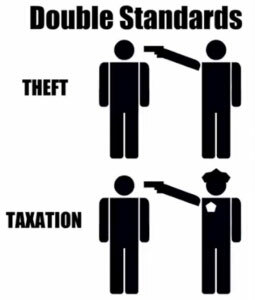 But the fact is taxation is not that, much of our governments and day to day expenses are riddled with the costs of the global, top-to-bottom corrupt economic system that has been “normalized” over the last couple hundred years (much like the 9/11 mainstream narrative over the last 15). If you haven’t come to terms with the global financial system and how all governments (whether knowingly or unknowingly) are complicit with the globalist, banking cartel… then there’s almost no point in debating/discussing about taxation, the state, and more anarchist/voluntarist ways of ordering ourselves financially and collectively as a society. The interest payments paid on national debts (never mind corporate or personal debts) to this banking cabal are astronomical, and a significant portion of most nations taxes go toward making these interest payments. There is no good reason why money, banking, and credit should be for profit. 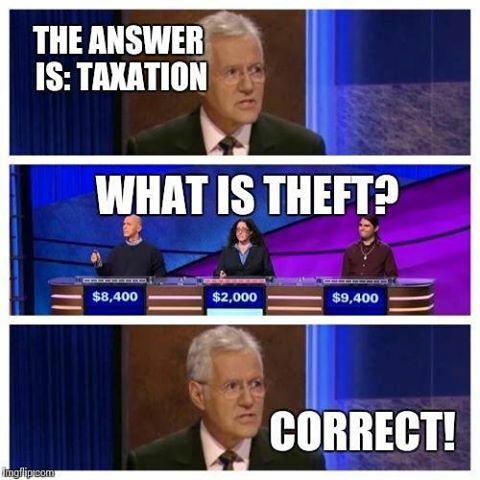 Taxation as it stands is largely just another vehicle thru which the money/credit creators steal from the masses (much like the stock market, monopolys, etc). And technically, within the US the income tax is still illegal, it just has never been revoked since WWI in Canada and the US… The income tax become fundamentally required in order to prop up the debt based monetary system that was implemented in North America in the 20th century. Like most things, taxation isn’t just about taxation. Are you talking about Income Taxes, Sales Taxes, or both? Because if you are arguing that individuals shouldn’t have to pay Income taxes…then I would agree with that, however sales tax or service tax, well that’s different. Furthermore, it would seem you are confusing our current fiat monetary system of Usury and comparing it to the pre 1863 gold standard of slavery. 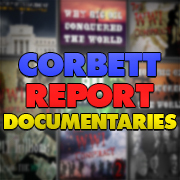 Before any further discussion about taxation, I think a prerequisite question would be have you seen the documentary 97% Owned and/or Money Masters and/or The Secret of Oz and/or Corbett’s Century of Enslavement? It’s important to have a thorough deconstruction of the web of debt and lies that has been spun and “normalized” over the last several hundred years in regards to banking, credit, and monetary systems (now globally accepted as mainstream economic dogma). Ah k, cool. Which one(s) have you seen? Definitely important to be educated to some degree about present “economics” before addressing present political/social issues. Didn’t know these “documentaries” were gospel in the church of James, but I’m ready to discuss taxation regardless. No, people did not give their consent. Let’s be extremely clear on this: No consent was asked beforehand and none was given. A situation where where one party is intimidated by threat of violence into transferring something to another is theft. One could perhaps argue on consequentialist grounds that somehow the theft is justified, but that constitutes a separate issue entirely. The basic coercive nature of the transaction remains. People give their consent everyday when they go about their daily lives, whether its when they pay gas tax at the pump, or when they give their Social Insurance Number whenever they get hired in order for them to receive a paycheck. Of course if you make a conscientious decision to not pay any Income Taxes, then you will need probably need to defend your decision in court, and as far as I know, nobody said the government owed us a living, and as far as I know, there is no law that dictates you have to pay income taxes if you are a American. Forget about the state’s laws it doesn’t follow them anyway. If you don’t pay taxes will you be put in a cage or not? There are lots of people who have done federal time (i.e. in prison) for not paying their income tax. It takes very little research to find this out. 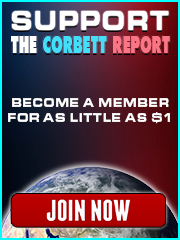 In North America, taxation is yet another apparatus thru the “legitmatized” cooercion of the state to further the aims of the globalist “deep state” and the central banking cabal who will do whatever it takes to have total economic hegemony within the world’s economy and it’s social/political direction. I don’t consider being given the option of either paying a ransom or being kidnapped and thrown in a cage to be “consent”. Even if by the statists own rules people are not obliged to pay them taxes, that does not stop them harassing people and throwing them in cages, because that is just the kind of thing statists like doing. Also, if a robber steals your money and your watch and then gives the watch back – you have still been robbed! So the argument that you might get something back does not stand up either.